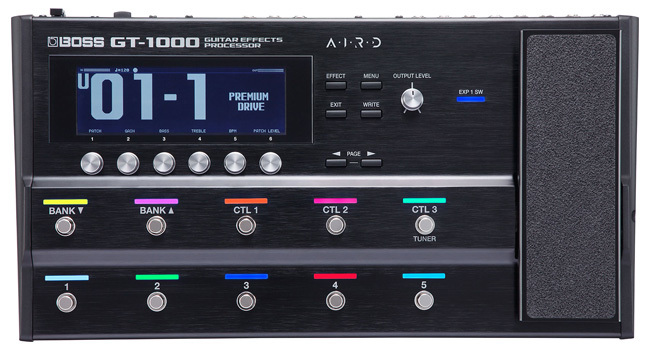 Today, Boss announced the release of its new guitar effects processor, the GT-1000. What's exciting about this one is that it's the first piece of hardware to debut Boss's new Augmented Impulse Response Dynamics (AIRD) technology. The AIRD tech is based on Boss's Tube Logic approach and—according to Boss—functions like a real tube amp, with "authentic tonal dynamics that were previously unattainable." Its Output Select functionality allows you to transfer the same sound with any setup, whether you want to use it for full-range stage monitoring, as a standard guitar amp, or for direct recording. The system is supported by a DSP engine, 32-bit AD/DA, 32-bit floating-point processing, and a 96 kHz sampling rate. It features a range of built-in Boss effects and is Bluetooth-capable so that you can organize patches and adjust parameters right from your phone. Check out Boss's video below for a closer look. This announcement follows up Boss's introduction of the Katana-Air a few weeks ago. The Katana-Air is a totally wireless guitar amp system that promises great sound with ultra-low latency. All you have to do to use the Katana-Air is plug a wireless transmitter into your guitar's cable input jack, and you're in business. As demonstrated in the video below, you don't even need to turn the amp on—just pick up your guitar and start playing. The Katana-Air features five unique amp characters, access to over 50 Boss effects, six onboard memories for storing favorite amp and effects setups and combos, and up to 30 watts of power. It can be powered by eight AA batteries or an included AC adapter.